VAN HOC NGHE THUAT – Founder and Publisher Vo Phien, HOP LUU - Editor-in-chief Khanh Truong, SONG VAN – Editor-in-chief Nguyen Sao Mai, TAP CHI THO - Editor-in-chief Khe Iem, THE KY 21 - Editor-in-chief Vuong Huu Bot, VAN - Editor-in-chief Nguyen Xuan Hoang, VAN HOC - Editor-in-chief: Nguyen Mong Giac, VIET (with an emphasis on criticism) - Editor-in-chief Nguyen Hung Quoc, CHU DE - Editor-in-chief Nguyen Trung Hoi, PHO VAN - Editor-in-chief Nguyen Xuan Thiep, GIO VAN (Premier Issue launched April 2003) Editors: Han Song Tuong, Nguyen Thi Thanh Binh, Nguyen Thi Ngoc Nhung, Phan Tuyen Tu. VAN HOC, VAN, HOP LUU, THE KY 21, SONG VAN, VIET, and Tap chi THO. emphasis on literature, which was founded by writer Vo Phien and under the editorship of writer Le Tat Dieu, launched on April 1978. Numbering begins with the first issue called Number 1. Description: ¾94 pages, 21cm; number 1: April 1978. Mac Do, Le Tat Dieu, Pham Tang, and Hoang Dung. · Issue 13 in 1979 (second picture above) marked the end of VHNT’s old volume. The new volume was not published until 1985, and again, discontinued after the publication of issue 8 & 9, Dec. 85 – Jan. 86. Description: 21cm; issue 8 & 9, Dec. 85 – Jan. 86. The first page is marked 925, the last page 1156. 8 & 9 by: Vo Dinh, Dinh Nguyen, Kiet Tan, Nguyen Thi Hop, Nguyen Ba Trac, Nguyen Tat Nhien, Ngoc Dung, Huy Luc, Chu Vuong Mien, Ho Truong An, Thai Tuan, Luan Hoan, Phan Thi Trong Tuyen, Nguyen Khai, Thai Tu Hap, Le Diep Cam, Vo Nga, Nguyen Mong Giac, Ngo Lam. Van Hoc Nghe Thuat, for her new volume, obtained an International Standard Serial Number, ISSN: 0885-128X. This International Standard Serial Number remained with the magazine when she changed her name to VAN HOC in the following special issue on poetry published on Feb. 1986, which started a completely different volume (See VAN HOC below). Pham Quoc Bao, Quyen Di, Vo Dinh, Nguyen Mong Giac, Nguyen Duc Lap, Dinh Nguyen, Vo Nga, Nguyen Tat Nhien, Hoang Khoi Phong, Bui Vinh Phuc, Vu Huy Quang, Nhat Tien, Nguyen Ba Trac. Administrative manager: Vo Thang Tiet. Garden Grove, CA 92643 (USA). · Vietnamese literary magazines published abroad, after VHNT. Factual information on respective literary magazines published in the USA and Australia. Alphabetically listed (except titles added after 2000). Published: Garden Grove, CA: Tan Thu & Thoi Van Publishing Group. Description: 21cm; Premier Issue 1991; numbering begins with issue 2 of December 1991. Cover Art (issue 2): May by Nguyen Trung. A bimonthly literary periodical founded in 1996 by Nguyen Sao Mai. Published: Miami, Florida: Songvan Magazine, c1996-, operating in Dade County, Miami City, American State Florida. Frequency: Bimonthly, later Quarterly (beginning with issue 14 of July-Sept. 1999). Description: A magazine of literature and art; 21cm. First issue called ‘Premier issue’ (March 1996), numbering begins with Issue 2 of May 1996. Kinh Duong Vuong, Nguyen Thi Hoang Bac, Nguyen Thi Thanh Binh, Nguyen Quoc Tru, Nguyen Nhan Thuat (not listed, staff-writer since Premier Issue). Le Bi, Hoang Phu Cuong, Pham Viet Cuong, Phan Tan Hai, Khe Iem, D. Kh., Tram Phuc Khac, Nguyen Hoang Nam, Chan Phuong, Nguyen Tien, Huynh Manh Tien, Trinh Y Thu, Nguyen Tien Van, Ngu Yen. · Editorial Board: Do Quy Toan, Do Ngoc Yen, Ha Tuong Cat, Hoang Ngoc Tue, Ly Van Chuong, Ngo Manh Thu, Nguyen Phuoc Quan, Pham Phu Minh, Pham Quoc Bao, Tran Van Ngo. · Staff Writers: Bui Bich Ha, Hoang Chieu Nhan, Hoang Khoi Phong, Lan Huong, Ngo Nhan Dung, Nguyen Ai Nhan, Nguyen Chi Kham, Nguyen Duc Tuong, Nguyen Hung Vu, Pham Phu Minh, Thanh Thao, Tran Doan Nho, Tran Mong Tu, Tran Ngoc Tuan, Tran Quan Niem. Publisher: Saigon, VN: Nguyen Dinh Vuong (1963-1972; Westminster, CA: Mai Thao (1982-1996). Description: A magazine of literature and the arts, founded by Nguyen Dinh Vuong (Saigon, South Vietnam: 1963); republished in the US in 1982 by Mai Thao who is the former managing editor of Van Magazine (1973); 21cm. The magazine was under Mai Thao’s editorship until 1996, when in his ailing health he left it to Nguyen Xuan Hoang who is the former managing editor of the magazine (Vietnam: 1972-1973). After the last issue of VAN HOC NGHE THUAT new volume, issue 8 & 9, Dec. 85 – Jan. 86, the magazine continued with the new name VAN HOC. The International Standard Serial Number, ISSN: 0885-128X, remained with the magazine in the following special issue on poetry published on Feb. 1986. Editorial address: 10104 Westminster Ave., Garden Grove, CA 92643 (USA). Published: Tustin, CA: Van Hoc. Description: A magazine of writing and analysis of literature and art, 21cm. · Editorial Board: Nguyen Mong Giac, Nguyen Xuan Hoang, Mai Kim Ngoc. · Editorial Board: Mai Kim Ngoc, Nguyen Xuan Hoang, Thach Han, Chau Van Tho, Nguyen Mong Giac. In 2000, Nguyen Xuan Hoang withdrew from the Editorial Board to devote his whole time to Van Magazine of which he has been the Editor-in-chief since issue 160 of Sept. 1996. 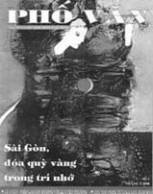 Van Hoc Magazine was under Nguyen Mong Giac’s editorship until 2004, when because of his ill health he left it to Cao Xuan Huy who is the former managing editor of the magazine in 1991. Issue 220 is the last issue under the editorship of Nguyen Mong Giac. Cao Xuan Huy takes charge of Van Hoc’s New Volume, beginning with issue 221 of September 2004. Van Hoc’s New Volume from then on was published bimonthly. Editorial Board: Le Thanh Nhon, Uyen Nguyen, Chim Hai, Vi Hoa, Nguyen Hoang Van, Nguyen Hoang Tranh, Pham Mieng Tuong, Nguyen Minh Quan, Le Van Tai. Published: Portland, OR: Chu De. Description: A literary magazine with an emphasis on exploration and experimentation; 21cm. First issue called Premier Issue (April 2003); numbering begins with Number 2 of November 2003. Nguyen Thi Ngoc Nhung, Tran Sa. (Note: Tran Sa withdrew from the Editorial Board after the first issue. The new Editorial Board includes Phan Tuyen Tu. After Issue 3, Nguyen Thi Ngoc Nhung withdrew from the new Editorial Board. Issue 4 of November 2005 was under the editorship of Han Song Tuong, Nguyen Thi Thanh Binh, and Phan Tuyen Tu). The Writers Post, based in Miami, American State Florida, established in 1999.